Cheesy vegetable cutlets is a deep fried patties made from vegetables, potatoes and cheese. It tastes yummy and can be had as evening snack or even presented as side dish or starter. Kids will love this recipe. 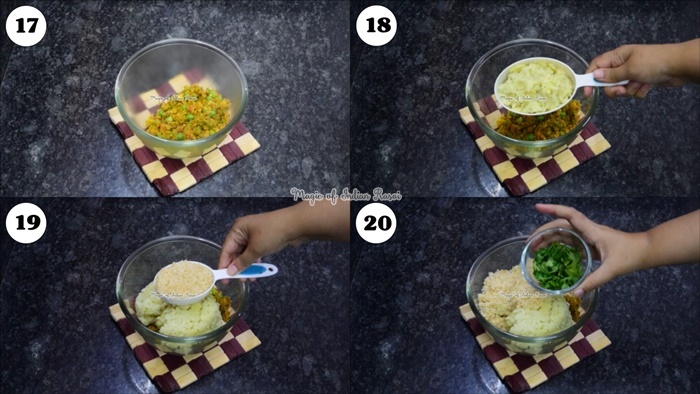 You can use vegetables like potatoes, capsicum, onions, cabbage, carrots, peas, corn, beans, etc to make it. Small cheese cubes are stuffed in between the cutlets. Shape them as you like it - round, oval or heart shape (using a mould!). It is easy to make and you can also shallow fry them. 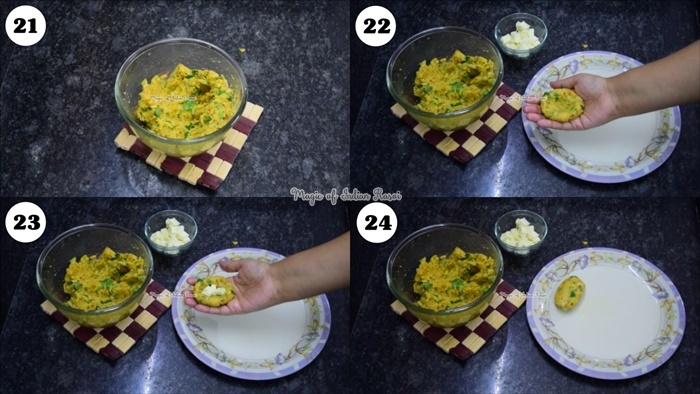 You can also prepare them in advance and keep in fridge for up to 1 day and fry it when required - like you can pack for kid’s tiffin! 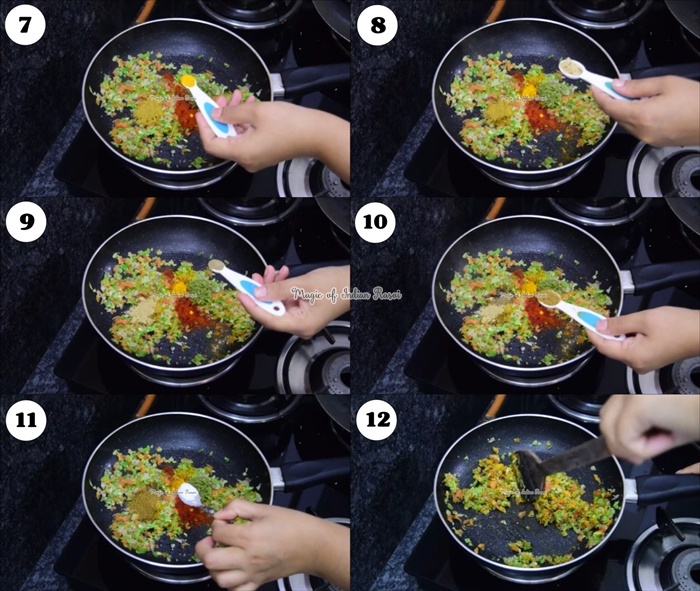 Do try this recipe and let us know how you liked it! 1. Take 1 tbsp oil in a pan. 2. Add asafoetida & mixed vegetables. 3. Keep flame low. Add ginger-chillies paste, red chilli powder, coriander powder, turmeric, chaat masala powder, black pepper powder, cumin seed powder, salt to taste. 4. 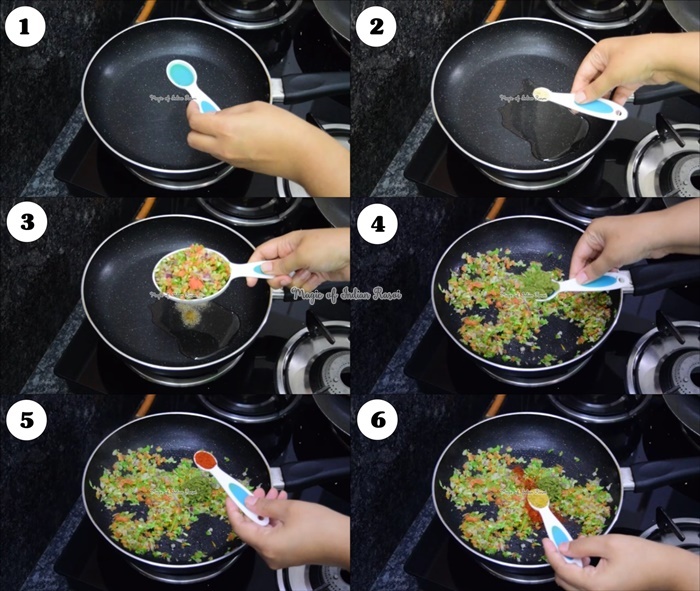 Mix well & keep vegetables crunchy. 5. Add semolina & boiled peas. Mix well. 6. 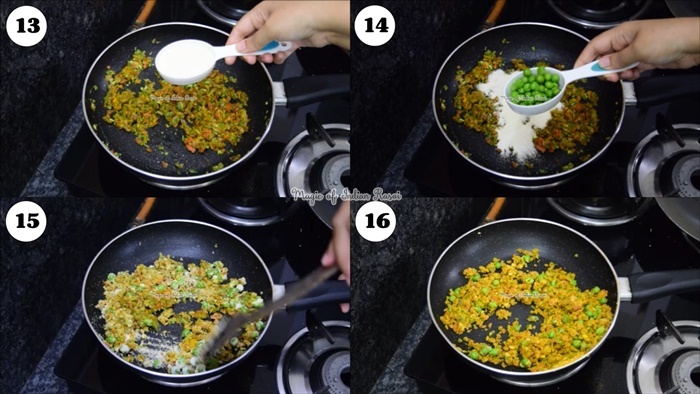 Cook mixture for 1 min. 8. Transfer this vegetable mixture to a bowl & allow cooling for 5-10 min. 9. Add boiled & mashed potatoes, 1/3 cup fresh bread crumbs, finely chopped coriander leaves & mix well. 10. Check salt & adjust if required. 11. Using greased hands take a small ball of mixture, flatten it & put 2-3 small cubes of processed cheese. Roll it from all sides covering it & then roll in oval shape. 12. 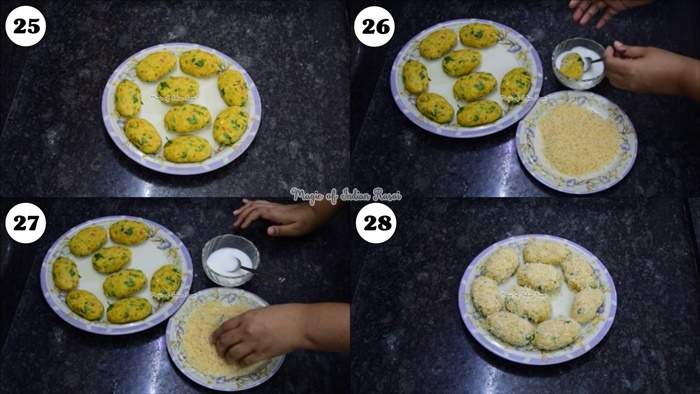 Prepare all cheesy cutlets in same way. 13. Dip cutlets in corn flour slurry & roll it in fresh bread crumbs. 14. Put vegetable cutlets to set in refrigerator for 30 min. 15. Fry cutlets in batches of 4-5 keeping flame on high. 16. Once they are golden brown on one side turn it over & fry on other side. 17. Take out on paper napkin once golden in colour. 18. Fry remaining cheesy vegetable cutlets in same way. 19. Serve hot cheesy vegetable cutlets with tomato ketchup & green coriander chutney! 1. Here I have taken onions, capsicum, cabbage & carrots. If you wish you can also add beans, corn & beet root. 2. Grind bread slices in mixer grinder for bread crumbs. 3. For making cutlets you can roll in any shape you like. You can also make round shape or use a mould such as a heart shape. 4. 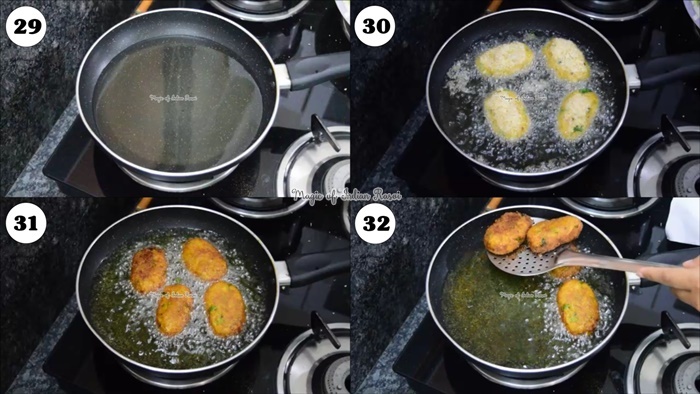 You can fry cutlets without coating them with corn flour slurry & bread crumbs too. But rolling them in corn flour & bread crumbs makes them crispier. 5. You can either deep fry or shallow fry the cutlets. 6. While frying cutlets don't turn often. Once done on one side turn it over & fry on other side. Copyright © 2016 Magic of Indian Rasoi.